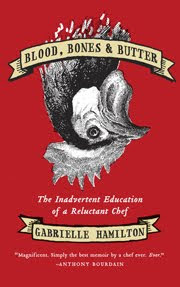 Prune chef/owner, Gabrielle Hamilton, serves up a reading of her much-anticipated memoir, Blood, Bones, and Butter at the powerHouse Arena tonight. The virtuoso of victuals talks with food writer Peter Meehan, (Momofuku) about her childhood and inadvertent culinary education that took her from the mountains of Pennsylvania to the Italian countryside, to the Midwest and back again. Bonus: drinks will be served.